I think the most critical ingredient above all else are the fresh-from-the-field mung beans, I bought here. While we assume that all dried beans are created equal, I suspect the the freshest munggo makes the yummiest dish. 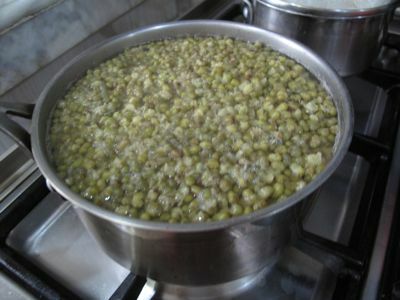 For a recipe that feeds roughly 10-12 dinners, measure out some 400 grams of mung beans and cover with water, roughly 2.5 times water to the volume of beans. Boil until soft, roughly 25-30 minutes for fresh beans. Add water if necessary while cooking. Turn off the heat and set aside. I like there to be quite a bit of liquid but not soupy. Next I sauteed some chopped onion, garlic, tomatoes in vegetable oil until their juices had rendered. Add a couple of tablespoons of dried dilis and a tablespoon or two of bagoong alamang (I used Alavar’s) and saute for a minute or so. 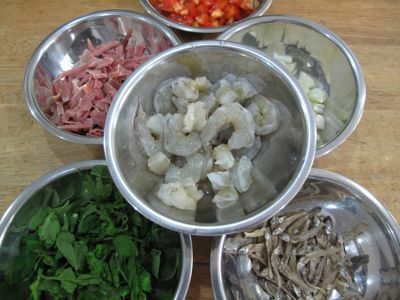 Then add 1/4 kilo of peeled small shrimp or chopped larger shrimp or prawns. I added roughly 200 grams of chopped/shredded ham that we happened to have in the fridge and at this stage I knew something good was cooking! 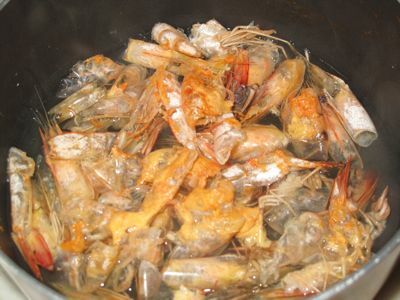 Earlier, I boiled the shrimp heads and shells for about 10-15 minutes, mashed them up violently and strained the juice. 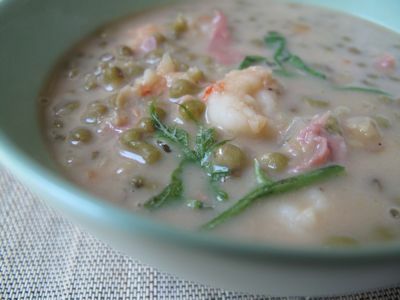 Now, I added the mung beans and the cooking liquid into the pot with the shrimp and ham and added shrimp broth. Add half a cup or so of thick coconut cream. Season GENEROUSLY with good salt and lots of freshly ground black pepper and simmer for say 8-10 minutes. Just before serving, add some tendrils of ampalaya (talbos ng ampalaya). If you like your munggo a little soupy eat this immediately. If you want it more starchy, let it sit for 5-10 minutes before serving. This dish was dynamite! The beans were the star but the “sahog” or flavor sources made it special; not overpowering the beans, but providing notes of texture (soft, chewy) and flavor (dried fish, salty ham, sweet shrimp, bitterness, etc.). Definitely a winner. The photos don’t do the final dish justice. thank you, salamat gid, your posts always brighten my day here in frigid snowy Michigan. love the comfort food – guinisang monggo! with pinakas! still waiting for the anthony bourdain special on the Philippines, so far, the new season shows have been on mexico, venice, next week will be washington dc in time for Obama’s inauguration. cant wait to see his philippine trip and you. one of my comfort foods. there’s nothing like a cold winter night with a bowl of hot ginisang munggo and steamy rice tapos kakain nang nakakamay. mmmm, sarap! thanks for sharing MM. Your mestizang munngo looks yummy. I guess thatâ€™s the big difference of fresh beans right from the source and the supermarket beans who know how they have been in that plastic packaging. High protein food from different sources – sea, plant and meat. When we make ours, it is like a spin off of pinakbet. We added sliced ampalaya, okra, squash, spinach and green chile and passed the boiled beans in a food mill. I love mine chunky and thick with crushed pork chicharon thrown in at serving time. I believe every household has their own take of ginisang munggo. I can tell you it is a crowd filler. You can feed a whole band with a big pot of it and still some left for the host to enjoy! Ummmmm..one of my comfort foods. You made a wonderful version.Munggo always reminds me of my late father who always said it was a very cost effective dish–inexpensive yet really nutritious–and delish!! We had alugbate plants (cousins of spinach) which we would put in. I realize now that our simple folks in the provinces get a lot of nutritious vitamins and minerals from food they eat many times off the tree or out of the sea (hihi it rhymes).. Thanks MM for reminding me of my late father. At every meal,he would expound on the vitamins and minerals found in every dish we ate. This made for interesting table conversation. It also made veggies interesting—reason why all of us enjoy eating veggies to this day. Off topic,it’s 4am and couldn’t sleep so I opened my computer. Couldn’t help but think of little piggies again. We had a piggery when I was young and am trying to recall if they like being upside down. I had my own little piglet with a pink ribbon round his neck. They like being scratched in the bellies…and you could make them lie still on their side only if you do that. I guess that photo you took has to me–become thought provoking. It initially made me feel pity for the piggies—but as I read the comments–thought- yup,it might be a better way to transport them that way. Ah! But i digress too much. Love this munggo post!! Nostalgic. Daghan salamat MM!! It’s 4:50a.m. and the current weather (nippy) is perfect for a bowl of your mungo!!!! yummmmmmm! my favorite dish with a little twist. Good job mm! in iloilo, the usual way the cooks do this is with sitaw, squash and maybe spinach or whatever greens you have..it is usually pork-based—-try it with pork hocks!! it’s delicious with coconut milk and bagoong and whatever pinoy veggies i have in the fridge. growing up,i used to like it just ginisa, with nothing but monggo and a little bagoong, the consistency of pancake batter. good with hot rice and fried fish! yummy!!! I love guinisang monggo with squash. served with hot rice and mashed up altogether. 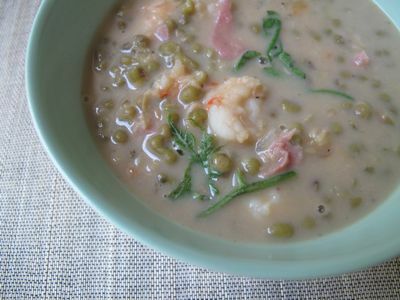 perfect meal for this nippy weather=) thanks for sharing your recipe MM! Do you sift out the monggo in water before cooking? My grandmother and mom taught me to put the uncooked beans in water so that the “light” ones float to the top and then to discard those. We also get some softened beans out of the pot and mash them before adding them back in so that the mixture is thick and hearty when cooked! Yum! Thank you for this. Reminded me that we have not had monggo for a while now! yum! ok, today’s post has persuaded me to up monggo day from friday to tonight. ginisang monggo and pritong daing na bangus for dinner. which brings back memories of a time when our N first experimented with the newly bought pressure cooker. she tried the pressure cooker for the first time by boiling monggo. what she did not know was to release the pressure knob on top first and let it steam out. i do not know how she managed to open it up, but all i remember is that the monggo shot up our kisame and got stuck there for a long time. she has not used it then, and until now she still uses the long cooking method of hours of simmering to get her food tenderized. You made the ordinary monggo’s star shine so bright with your version!=) I never imagined wanting to serve monggo for a get together lunch or dinner until now with your version. I probably let this sit for a while. Thick ginisang monggo is my comfort soup poured over hot rice hehehe! We prepare our munggo slightly differently in our home. We use the split-type / cracked munggo and soak it in water overnight. We cook it with lots of onions and tomatoes and add a lot of pork slices and shrimps. I see my dad cooking it until its thicker in consistency. We call it Gerber, munggo flavor. Hahahahaha!!! ginisang munggo and fried galunggong !…the best things in life…. monggos, as we call them in bohol, is always my favorite. ginisa. ginataan. viand. snack. basta monggos lami jod! Your version looks yummy! For a healthier version, you can use malunggay leaves. By the way, I liked mine topped with crispy dilis flakes! Other add-ins…pieces of chopped bagnet, flaked tinapa. This is one of my favorite pinoy dishes…ultimate comfort food! Your version sounds delicious MM! I love the addition of gata…will try that soon! I like monggo when it is thicker in consistency. Meaning, I smash it all up when it’s tender. Also, you can render some bacon for added flavor, like cooking lentils. Have you ever tried eating boiled monggo with some sugar, milk and ice cubes added to it? We used to have this as snack or dessert when we were kids. Ooo, I’m feeling inspired to cook monggo this week! I have some dried scallops and mushrooms too, I might toss that into the pot and see how it turns out. Not having learned how to cook it I just buy split pea soup and add patis to capture a bit of the ginisang monggo flavor I remember from home. With my folks getting older they already stopped serving it at home due to its high level of uric acid. Bad for rayuma daw. My brother would surely come by to my house whenever I cook “rolling stones” for him and his family, that’s what we call it when we were young, because it is an inexpensive fare we always have it every friday as far as I can remember. I always put alugbati and eggplant freshly picked from our backyard. Ulam ng mahirap pero puno ng sustansya, it sustained us of important nutrition while we’re growing up, brain food daw says my H.E. teacher. Well forget about uric flare up now, ginisang munggo for me is still one the best, a very humble pinoy food. the addition of coconut cream is new to me though, will have to try that this Friday – survey lang po – how many of you here have had monggo on Fridays and on Fridays only? Preferably/probably with a fried fish dish! Ma makes it like Maria Clara’s, but instead of pork, she adds fried fish bits just before serving. This dish is really great paired with freshly steamed white rice. Yum! mr. mm…we mash raw shrimp heads and shells (without the sungay or my mom calls it sungot and the tail) …my mom uses this age old almires (mortar and pestle) pounding them till she squeezes all the juice and dilute them in small amount of water to produce shrimp stock…add it to any sauteed mixture stir it to a boil to prevent it from getting lumped or buo-buo. yummmm….. Thanks once again for bringing me back to the comforts of my childhood, MM! I haven’t had any in donkey’s years, but will try it soon, and with coconut cream, which I love. It’s been very gloomy here in Victoria lately, so the other day I made some arroz caldo with lots of ginger – I even put in some tripe which my Mom used to do, as well as the chicken. It was pretty good, but I think I’ll top it with fried garlic shavings next time, to give it some crunch. I cook our gunisang monggo with kani (crab stick) and crushed lapids chicaron. with a lot of dahon ng ampalaya or dahon ng malunggay and pair it with paksiw na boneless bangus. yummy! I love Cafe Bola’s Parma-ham scented mongo! YUMMY!!!! Will take it at any given day! Hi MM, You can try the ilocano style where they actually grind the monggo. It has a different texture and taste but nevertheless still yummy. You may want to use your claypot to cook your monggo. This dish has been a favorite of mine since I started eating rice! In our household, nothing beats monggo simmered with HAM BONE and then sauteed with ham bits falling from the bone…and then topped with crispy shallots and deep-fried spinach leaves (like CRISPY KANGKONG!) before eating…and some crunchy chicharon…Haaaay! it is really really really good!!!! Dry-roasting the monggo before boiling them adds a new dimension to the dish, smell-wise. That’s how my late Lola did it, and my mother wouldn’t have it any other way! I never thought about adding coconut cream to my monggo version, I should try that. I always use bagoong “balayan” or the fish bagoong instead of the alamang when making monggo, and since ampalaya leaves are hard to find in my neck of the woods, i find that watercress is a good substitute. And of course it will never be without cracklings and tinapa flakes. We usually use bagnet/seseron/lechon kawali and shrimp and use ampalaya leaves if we have it if not we use the ampalaya itself sliced diagonally not so thick or thin and we also add ginger. I never have tasted coconut cream in the munggo except for the dessert called “lelot balatong”. In Singapore they actually have a dessert where they have a red bean with coconut cream. You can eat it hot or cold. In Singapore they actually have a dessert where they have a red bean with coconut cream. ooooh, i tried making this dish this week too! inspired by the cold weather, and monggo “soup” at home, i used dried fish for the “meat”. all i can say is… i got lucky this week! but i think i like your shrimp version. i hope to try that soon! my dad loves monggo and passed that on to us, his kids. i think what i love most about ginisang monggo is the simplicity of the dish, yet it can be prepared in a variety of ways. love it with alugbati, ampalaya leaves, kangkong, or watercress. Wow, what a version. I never thought of adding cracklings, tinapa flakes or “fried spinach” (Bettyq, I will try this soon) in monggo;nor I have tried adding bagoong. This really sounds good; for sure will cook this way. Thanks for ya’ll sharing your method of cooking this lovely dish, which can be eaten either summer or winter. Wow! I tried this and even without the coconut cream, the recipe blew me away! Best munggo I’ve ever had! other than just lechon paksiw, my mom, would take the lechon patas and save them for ginisang munggo. the gelatin in the patas are just so yummy when slow cooked into the munggo!